A graphic novel adventure from the world of Erin Hunter's #1 nationally bestselling Warriors series! 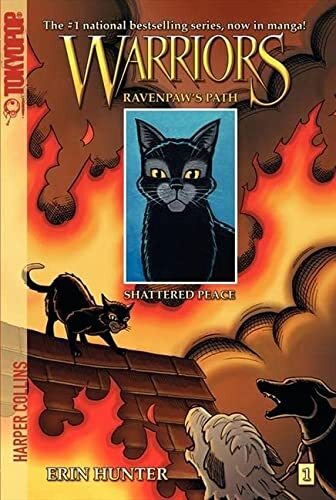 In the first book of the Ravenpaw's Path manga arc, find out what happened to Ravenpaw after he left ThunderClan in Warriors #1: Into the Wild. Ravenpaw has settled into life on the farm, away from the forest and Tigerstar's evil eye. He knows that leaving the warrior clans was the right choice, and he appreciates his quiet days and peaceful nights with his best friend, Barley. But when five rogue cats from Twolegplace come to the barn seeking shelter, Ravenpaw's new life is threatened. He and Barley must try to find a way to overpower the rogues-before they lose their home for good. Ravenpaw has settled into life on the farm, away from the forest and Tigerstar's evil eye. He knows that leaving the warrior clans was the right choice, and he appreciates his quiet days and peaceful nights with his best friend, Barley. But when five rogue cats from Twolegplace come to the barn seeking shelter, Ravenpaw's new life is threatened. He and Barley must try to find a way to overpower the rogues—before they lose their home for good.